Copyright? (1 + 29 + 2 + 5 + 2 = 39) Test. On this page ... Ogden, Oswald & Co., Robert Pace, William Pearson, George Peverall, page bottom (Last of the Summer Wine). Do you want to make a comment? A site guestbook is here. I know nothing about T. Ogden, alas. He built, I read, 15 or 16 vessels between 1824 & 1845. Including Dundee referenced below. A barque. Per 1 (data), 2 (1854 wreck data). The vessel is Lloyd's Register ('LR') listed from 1839/40 thru 1854/55 (ex 1848/49), owned for that entire period by 'Borrie' of Dundee, initially, thru 1846/47, Borrie & Co., & from 1846/47, J. Borrie. Link 1 tells us that the vessel was repaired in 1847, 1849 & 1853. Its initial service, in 1839/40, was, per LR, from Sunderland to St. Petersburg, Russia, then from 1840/41 thru 1844/45 for service from London to Calcutta (now Kolkata), India. From 1845/46 thru 1847/48 at least, the vessel served Archangel, Russia, ex Dundee & in 1849/50 served the West Indies ex Dundee. LR of 1850/51 records her intended service from Liverpool to the Cape of Good Hope, South Africa. In 1853/54 & 1854/55, per LR, the vessel served Melbourne, Victoria, Australia, ex Dundee. Thanks to Trove, Australia, we can provide some detail. On Feb. 22, 1853, the vessel left Dundee for Melbourne, arriving there on Jul. 17, 1853. On Sep. 7, 1853 it left Melbourne, in ballast, for Sydney, New South Wales ('NSW'), under the command of S. G. Jamieson, however on Sep. 13, 1853 it rather arrived at Newcastle, NSW, & there took on cargo including 430 tons of coal for Melbourne. On Jan. 21, 1854 the vessel left Melbourne in ballast, now under the command of captain A. Scott, for Port Fairy/Belfast, on Victoria's coast W. of Melbourne. Later that day, when off Bird Rock, Geelong, the vessel ran into the starboard quarter of Osprey, a schooner, carrying away her mizzen mast. Dundee was not damaged in the encounter. The vessel then went on to Port Fairy & was moored there taking on a cargo of wool for London when the area was hit early on Feb. 26, 1854 by a major SE gale with giant seas. On Mon. Feb. 27, 1854, Innellan, a barque, was driven on shore, soon followed by Dundee which broke her moorings & fouled Benjamin Elkin, said to be a ship, on its way to shore. Dundee ended up completely broken up on the beach with its cargo of about 900 bales of wool floating out to sea. No lives were lost in the disaster. As per this contemporary newspaper cutting. Link 2 indicates that J. Borne was Dundee's then owner, rather than J. Borrie as is LR listed for many years. Can you add anything? First a few images. Hover your mouse over each thumbnail to read the subject matter. The first image above is the listing image of a long expired n eBay item, of a print from the Mar. 1, 1872 issue of 'The Engineer'. Showing the engines that were installed in two ships that were built, in 1871, at the Oswald shipbuilding yard at Sunderland, specifically Bertha & Scindia. Neither of those vessels are detail listed yet on this site. The page was offered by vendor 'prints-4-all', of Scotland, who surely must be commended for posting listing images of such an amazing quality. I should add that these words were not solicited by 'prints-4-all'! Just written to recognise the quality of an eBay listing image, with no logos to destroy the visual impact of the print. Like many other names in these pages today, really just names. That require research - to the extent I can in fact do that. I have seen a few references to T. R. (Thomas Ridley) Oswald. Need help! Thomas Ridley Oswald (known as 'Ridley' it would appear) was born Jun. 29, 1836 at Lewisham, Kent, the son of William Oswald (Aug. 8, 1795/Sep. 11, 1876), a Deptford Provision Merchant, and Elizabeth Florence (n�e Laing) (Aug. 12, 1805/Oct. 8, 1889), his wife. Ridley or his family must first have moved to Stepney, in the East End of London, & then to the north-east because he later became an engineer & shipbuilder & established a shipbuilding business in Bishopwearmouth, Sunderland. Hopkins advises, based upon the knowledge of Mr. J. W. Smith , i.e. 'Blue Peter' - He is first heard of as taking over a little "wood" yard from his father-in-law, Charles Malling Webster (presumably one of the Websters of Pallion Hall. The business, I presume, was not a success, since Ridley became bankrupt in 1862 (rather 1861, it would seem). But he recovered, rebuilt his business, & by 1871 he employed 19 men and boys. Per Hopkins, written in 1954, When Oswald decided to build ships of iron he built iron works at Castletown, imported and processed iron ore to the plates required in the shipyard. Also - In 1872 came crash number two, when he failed for �300,000 and his Pallion Yard was advertised to let on a 21-year lease with the option of renewal. It is probable that when re restarted in Pallion it was at the foot of Grace Street, where Shorts' Quay now stands. Ridley went bankrupt for the third time in 1875 & moved his business in 1875 from Sunderland to Woolston, Southampton, Hampshire, & there went into business (1876) with John Murray Mordaunt, i.e. 'Oswald, Mordaunt & Co.' Hopkins uses these words to describe the move - the whole yard was dismantled, and everything was packed into wooden boxes and shipped to Woolston ... The business was, I presume, a success because by 1881, it was employing no less than 1200 men. A giant business at the time, I am sure. It would seem, however, that Ridley failed once more at Woolston, likely about 1900 when the yard was sold. Ridley moved to Milford, Glamorganshire, where he continued for many years to build high-class ships, without getting into any more financial difficulties. He died at Greenwich on Jun. 22, 1916, at the age of 79. Hopkins commented - He must have been a great character, and every inch a man of iron to have been knocked down four times, and always to have come back to the great craft of shipbuilding. Brenda Avery, who is, I understand, a very distant cousin of Thomas Ridley Oswald, advises me that the 'Oswald' family was involved with shipping literally for centuries - since as far back as the 1600s! A Scottish family, from Kirkcaldy, with family members who served with distinction as Members of Parliament and with the military, but with, over the years, a continuing tradition of involvement in shipping & in shipbuilding. Ridley married at least twice. And had at least one son (by his second marriage to Wilhelmina Catherine), i.e. William Digby Oswald (1880/1916), who served in the Boer War but was later killed in France during WW1. This site (about 20% down page) advises that 'Oswald, Mordaunt & Co.', of Southampton, were the successor shipbuilding company to T. R. Oswald. Yes indeed, as the above confirms. Names of vessels constructed by 'Oswald'. In Sunderland. As I find them. In a table in build date sequence. A 3-masted iron barque. Per 1 (1886 wreck data, image), 2 (data & Charles Biggs image), 3 (Wikipedia, Mexico), 4 (text ex Illustrated London News, Dec. 18, 1886, re wreck of Mexico), 5 (images of 2 Eliza Fernley survivors 60% down), 6 (2 E. D. Walker prints of Mexico, larger images available), 7 ('wrecksite.eu', Mexico), 8 (the lifeboat house at St. Anne's in c.1887, ex 9, a large 'pdf' file) 10 (Miramar, link, you now must be registered to access). There are a great many WWW pages that cover the 1886 wreck. Just a few of them are referenced above. 150.1 ft. long, signal letters PWFR. Built for Temperley & Co. of London & registered there. The webmaster has, thanks to 'Google books', a number (not all) of editions of Lloyd's Register, visible in a giant image at left. The vessel would seem to have served North America, China & New Zealand in its early years. In 1878/79 'Carter & Darke', of London, became the owners. The Mercantile Navy List of 1880 references James W. Temple, of London as being the vessel's owner. By 1880/81, in which year there are two register entries, the vessel was owned by H. Ellis & Sons, of London. But was sold, to 'Oetling Gebruder', of Hamburg, Germany, & renamed Mexico. On Dec. 3, 1886, the vessel, Captain Burmeister in command, with a crew of 12 all told, left Liverpool for Guayaquil, Ecuador, with a general cargo. The vessel was hit by a severe westerly gale off the Lancashire coast, & anchored, in a dangerous position, off Ainsdale. In the night, she dragged her anchors & was driven ashore at Horse Bank, Birkdale, opposite the Palace Hotel, close to Southport, Merseyside, near the mouth of the Ribble Estuary. But a long distance from the shore. The nearby lifeboat stations at Lytham, St. Anne's & Southport came to her rescue & all of the crew was rescued. But at a giant cost. Three open rowed lifeboats with sails, manned by 44 volunteer crewmen went to the vessel's night time rescue. Lifeboat Eliza Fernley of Southport was at the vessel's side when a huge wave turned the lifeboat upside down. It never righted itself. 13 of her 16 man crew were drowned. Three were saved but one of the three soon died. Laura Janet, of St. Anne's, with a crew of 13 was also lost. So 27 of the 29 crewmen in those two boats were lost. Charles Biggs, Thomas Clarkson in command, of St. Anne's, on her maiden rescue run, rescued Mexico's crew & returned safely to St. Anne's. The worst such disaster ever - a sad procession through the streets of Southport at the civic funeral for the lost. A long expired website referred, I know, to the Official Inquiry into the loss of Mexico, but I do not recall if the site presented the actual Inquiry report. Can anybody provide the text of the report that likely was issued in the first few weeks of 1886? Also ... can anybody provide a large image of this related print. The Mexico was later re-floated, sold for �45 to a firm at nearby Preston, was repaired at Preston & became a tourist attraction for two years, moored at the Lytham St. Anne's pier. Later, presumably when owned by L. T. Merrow & Son, of Glasgow, she completed a journey to the Falkland Islands & back but was lost on Feb. 27, 1890 - stranded at Tantallon, Haddingtonshire, Scotland, while in ballast & in a NE gale. She became a total wreck. The 1886 disaster is the subject of 'The Great Lifeboat Disaster of 1886' (1 & 2) by J. Allen Miller, published in 2001. If any good came from the disaster, it was from its impact upon the design of later lifeboats to make them safer & self-righting. Can you correct the above, or add anything? Another image? An iron fully rigged ship, later a barque. Which had an amazingly long life. Per 1 (extensive Norwegian data, image Kotka), 2 (extensive data in Norwegian, ex 3 a 'doc' file difficult of access), 4 (Lloyd's Register data, Ironsides), 5 (data, Ironsides), 6 (1864 passenger data), 7 (arrivals data, in 1864 & later), 8 (Kotka, damaged by U39), 9 (Miramar, link, you now must be registered to access, but data is limited). 185.0 ft. (later 190.7 ft.) long, signal letters QHBM later HBVM. Some confusion as to the name - both Ironsides & Ironside are referred to. The Lloyd's Register data that I can access, from 1861/62 thru 1889/90, is clear - the vessel was registered as a ship thru 1878/79 & as a barque from 1880/81 but was always registered as Ironside. Built for Temperley & Co. of London & registered there. It would seem that the more complete owner's name was 'Temperley, Carter & Drake'. 6 records a May 6, 1864 voyage, from Gravesend, River Thames, London, to Auckland, New Zealand, with 197 immigrant passengers. Damaged? & repaired in 1867. 7 records the 1864 voyage & 4 more voyages to Auckland, 2 in each of years 1867 & 1879. The Mercantile Navy List of 1880, however, states that Wm. Leonard Darke, of London, was the vessel's owner. Listed as a barque in the 1880/81 register. In 1891, Alex. Stephens, of London, became her owner with no change of vessel name. The Mercantile Navy List of 1890, however, states that Andrew Stevens, of Swansea, was the vessel's owner. In Apl. 1897, the vessel was sold to A/S Kotka, of Fredrikstad, Norway, 'Johan Kjelsen & Lars Hauglund' the managers, & renamed Kotka. In 1899, Lars Hauglund became the manager. On Jun. 29, 1915, the vessel, en route from Stockton Springs, Maine, U.S.A., to Cork, Ireland, with a cargo of planks (timber), was attacked by German submarine U39, Kapit�nleutnant Walter Forstmann ('Forstmann') in command. At 51.00N/11.20W, west of Fastnet Rock, (SW tip of Ireland), 30 miles SW of Bull Rock Lighthouse, County Cork. There was no loss of life - the crew of 12 took to the boats & landed at Queenstown. U39 shelled the barque but it didn't sink. It was later towed to Cork, its original destination, beached, refloated & repaired. Repaired at Cork? Forstmann was the 2nd most successful German u-Boat commander during WW1. He sank or captured an amazing 149 allied ships & damaged others. Later in 1915, the vessel was sold to 'A/S Larvik D/S', of Larvik, Norway, A. S. Hasle the manager. In Mar. 1916, the vessel was sold again, to A/S Fjellheim, also of Larvik, 'A. S. Hasle & Jacobsen & Thon' the managers, & renamed Fjellheim. It would seem that in Feb. 1919 the vessel became registered at Christiania (Oslo), Norway. I direct you to the Norwegian words re an event in Mar. 1921. The vessel was, it would seem, en route from Iddefjorden (a fjord between Norway & Sweden) to Havana, Cuba, with a cargo of granite. It ran into trouble of some sort in the North Sea, returned to Fredrikstad & was repaired. (3/1921: Led sj�skade i Nordsj�en p� reise Iddefjorden til Havana med granitt. Returnerte til Fr.stad. Ble losset. Ikke reparert) The vessel was sold to ship breakers in Apl. 1922. An expired eBay item referenced the vessel being broken up at Greenock, Scotland, in 1923. The WWW translation of Norwegian is most difficult, so the above text may well need correction. Can you help with more data or another image? An iron single screw steamer, brig rigged. A passenger & cargo vessel, it would appear. Per 1 (launch announcement), 2 (data incl. 1893 pilgrims to Mecca), 3 & 4 (both same Etna data), 5 (West India & Pacific, St. Thomas). 150 H.P., 226.0 ft. long, signal letters VNQW, with accommodations for 40 1st class & 20 2nd class passengers. The webmaster has a number of editions of Lloyd's Register ('LR') available to him ex 'Google' books, thru 1890/91 - see left. Such listings generally clarify many matters but in this case the listings are a real puzzle. The vessel is LR recorded, in 1863/64 (not in image at left) & 1864/65, as Saint Thomas. The Mercantile Navy List & Maritime Directory for 1867 (page 338, image soon) & 1870 similarly names the vessel Saint Thomas. And it then totally vanishes from the LR registers for many years until 1873/74 when it appears as Etna. In 1887/88, LR advised that the vessel's name had changed from St. Thomas to Etna, a change that actually occurred 4 or so years earlier, in Apl. 1883. As I say, a puzzle. The vessel was built for Imrie & Co. and later the 'Liverpool, Western & Spanish American Steam Packet Co. Ltd.', which company was formed in 1863 & owned by Imrie, Tomlinson & Co. & Alexander Duranty & Co., both of Liverpool, who also were joint managers. The launch announcement states the vessel's initial owners to be Imrie and Tomlinson, & Dranty & Co., of Liverpool. 'Imrie &' is recorded as the vessel's owner in 1863/64, and 'Imrie & Co.' with the name struck out, in the 1864/65 edition of LR. Likely used for passenger & cargo service between Liverpool & ports in the West Indies. In Jan. 1864, the vessel was sold to 'West India & Pacific Steam Navigation Co. Limited', but I read that the registered ownership was not changed until Apl. 1865. In Jul. 1872, the vessel was sold to W. B. Forward, of Liverpool, & in Mar. 1873 sold or transferred to T. B. Forward, also of Liverpool, & 're-engined' in Oct. 1873 by G. Forrester & Co. of Liverpool. I have read that when 'Atlas Steam Ship Co. Ltd.' ('Atlas'), of Liverpool, was formed (in 1873?) the vessel was transferred to that company. For service between New York & the West Indies. And renamed Etna in Apl. 1883 - but that date is clearly incorrect since the 1874/75 LR records the vessel then i) named Etna & ii) owned by Atlas. In May 1884, the vessel was sold to Charles H. Pile, a ship broker, of London. In Oct. 1884, the vessel was sold to a name that I really cannot read in the available 'Google' data snippet, maybe 'J. H. Peel & S. A. L...', of London, & then sold by the mortgagee to William Ross, also of London. In 1885, (or maybe in 1886) the vessel was sold to A. Laming & Co., of London, maybe 'Alfred Laming & Co.' or A. H. Laming, (their sole vessel apparently). The vessel was 're-boilered' in 1893. On May 13, 1893, Captain Straker in command, the vessel left Swansea, Wales, for Jeddah (Jiddah, Saudi Arabia for Mecca) & Yembo (Yanbu, Saudi Arabia for Medina) via Tangier, carrying pilgrims from Morocco. A Sep. 8, 1893 report in LR advised that 100 passengers (pilgrims) & 8 crew members aboard Etna died of cholera in the Red Sea en route from Jeddah to Karaman, an island N. of Hodeidah (Al Hudaydah), Yemen, & a 'sanitary station for inward pilgrims from the East'. The vessel returned to Jeddah & then via Yembo, Beirut & Algeria to (ultimately) Middlesbrough. I am advised that on Aug. 8, 1893, the vessel arrived at Genoa, Italy, to be broken up. I thank Ted Nutt for his assistance re the above data. Can you help with more data and/or an image? A 3-masted iron barque. Per 1 (extensive history, in Norwegian & English), 2 (Miramar, link, you now must be registered to access). 168.6 ft. long, signal letters WHMS, later HGDM. I have read that the vessel was built for J. Jackson of Liverpool, from 1875 James Jackson & Co., both of Liverpool. Lloyd's Register ('LR') of 1864/65 (the first LR mention), in the supplement, indicates however that the vessel was owned by Cunard & Co. & then Jackson & Co., both of Liverpool. Owned by James Jackson of Liverpool in 1870. In 1880, R. B. Honan (Robert B. Honan per the Mercantile Navy List of 1880) became the vessel's owner. The vessel was sold in 1887 to J. M'Fee (presumably means 'McFee'), also of Liverpool. In 1889, A. W. Johanning (Arnold W. H. Johanning, of London (1890) became her managing owner), still registered at Liverpool. The vessel was removed from the U.K. registers in 1896. In 1896, the vessel was sold to 'A/S Bark Ellen' of Drammen, Norway, (Peder Wiborg the manager, & renamed Ellen, (though Miramar does nor reference the name). In Jul. 1900, while en route from Vera Cruz, Mexico, to Falmouth with a cargo of beans, Ellen was abandoned by her crew in the Atlantic, in a dismasted condition. She was presumably found, towed, initially maybe to the Solent, & then to Gravesend, repaired & returned to service. I have WWW found no detail as to the circumstances. It would seem that there was no loss of of life. In or about Sep. 1902, Ellen left Norway for Mombasa, Kenya, with a cargo of timber & then went to Zanzibar awaiting orders. On Mar. 25, 1903 the vessel left Zanzibar, in ballast, for Fremantle, Western Australia ('WA'), under the command of Elias Knudsen, aged 47, with a crew of 11 all told. The captain's son & nephew were amongst the crew. Dysentery struck the vessel when 4 days out of Zanzibar, the outbreak, caused by swarms of flies near Zanzibar, resulting in the death of her captain, the ship's steward & 2 other crew members, the sons of the captain & the steward. Theo Jorgensen, 2nd officer, took over command. The vessel encountered severe storms while en route to WA a situation most difficult with such a depleted crew. You can read all about it at 1 & via contemporary Australian newspaper cuttings (A & B). When the vessel arrived at Fremantle, on Jun. 10, 1903, the first mate (Andres or Andrea Olsen) & another crew member were sick & one of them was not expected to recover - I have not spotted what later happened to them both. In 1907, as is confirmed by LR of 1908/09, Ellen became owned by 'Actieslsk, Ellen' with Pettersen & Ullen�ss the managers, & registered at Porsgrund (Porsgrunn), Norway. I read that in 1916 A/S Ellen (Johs. J�rgens), of Kristiania (Oslo), acquired the vessel. In 1917, Skibs A/S Sand� (or Sand�i) (Christianssands Shipping Co. Ltd.), of Kristiansand (Oslo) became the vessel's owner & in 1920 H. T. Realfsen of Skien, Norway. The vessel was de-rigged in 1921 & became in 1922 a barge used to transport limestone, & owned by 'A/S Christiania Portland-Cementfabrik'. Was removed from the registers by 1924. We thank the folks who provided the data at link 1. Can you help with more info and/or another image? An iron immigrant/cargo steamer. Per 1 (Lloyd's Register ('LR') data, Medway), 2 & 3 (data, Medway, British Colonial/Temperley), 4 (detailed data re 14 voyages to Canada), 5 (an 1871 voyage), 6 (data), 7 (the launch of Medway), 8 (Miramar, link, you now must be registered to access). 285.2 ft. long, 220 or 230 HP, one funnel, single screw, two masts, speed of 10 knots. With a 'clipper stem'. The vessel, launched on Mar. 28, 1865, was built, per 7, for Temperley, Baster and Drake, of London, for the Atlantic & Mediterranean trade, but per LR for 'Temperley', of London, who owned the vessel in the 1865/66 & 1866/67 editions of LR. The Mercantile Navy List of 1867 records the vessel as owned by Jno. Temperley of London. In Apl. 1867, she was chartered to 'Hiller & Strauss' (have seen referred to as a U.S./Belgian company) & made 3 return voyages for them on the Antwerp, Belgium, to New York route. The vessel was repaired in 1867. In 1869, perhaps, she became owned by the British Colonial Steamship Company Limited, which company later, in 1872, became the Temperley Line ('Temperley'). However the Mercantile Navy List of 1870 states that Jno. Temperley was her then owner. Was damaged & repaired in 1871. Her 1st voyage for Temperley (London to Quebec & Montreal, Canada) commenced on Jul. 27, 1869. Registered at London. 14 voyages, 1870 thru 1873, London to Quebec & possibly to Montreal listed at link 4. LR of 1871/72 & 1872/73 refer to intended voyages to the Cape of Good Hope, while LR of 1873/74 refers to service from London to Boston. On Sep. 6, 1873, the vessel was wrecked in the Strait of Belle Isle (between the northern tip of Newfoundland & the mainland coast of Canada). 4 lives were apparently lost. Rex Harries advises (thanks!) that his great great grandfather�s brother � Captain David Harries of Soar Hill, Dinas Cross, Pembrokeshire, was the Captain of Medway when it was wrecked� in the Strait of Belle Isle (and for a few years prior). Recorded in Lloyd's Register as D. Harris. During his career, David was commended for recovering the transatlantic cable when they were laying it and it got lost. David Harries' nephew (Rex's great grandfather's brother) was one of the crew members lost in the Medway wreck. Can you help with more data? An iron cargo ship, brig rigged. Per 1 (Dunkerley, data), 2 (Miramar, link, you now must be registered to access). 212.1 ft. long, single screw, signal letters HGLT. Built for 'John A. Dunkerley and Co.' ('Dunkerley'), of Kingston upon Hull, a long established company (have seen an 1847 ref.) which served Scandinavian ports & the Baltic likely to as far E. as Saint Petersburg, Russia - since the Neva River enters Neva Bay at that city. There was a relationship between Dunkerley & The Mercantile Steamship Co. Ltd. ('Mercantile') of London, which named its ships after world rivers, hence Neva. In 1874/75 Mercantile became the owner of the vessel. The vessel was re-engined, in 1873, with compound machinery provided by C. D. Holmes & Co., of Hull. Mercantile was recorded in the Mercantile Navy List ('MNL') of 1880 as then owning the vessel. In 1888 it was sold to W. H. Stott & Co., of Liverpool (the MNL of 1890 states Wm. H. Stott), which company later became 'Stott, Cocker & Co.'. In the 1900 MNL list, the vessel is recorded as being owned by "Neva" Steamship Co. Ltd. of Liverpool. On Feb. 16, 1907, the vessel was stranded on the coast of Denmark, (exactly where & in circumstances unknown, can you tell us about them) was towed (I presume) to Hamburg, Germany, where, seriously damaged, it was broken up. We thank Ted Nutt, for providing most of the information in this listing. The WWW record for this ship is essentially non-existent. Can you help with more data? Now I have also read, in a Google data 'snippet', that in the 1870s, Dunkerley 'passed over' its ships to Newcastle Steam Shipping Co. I suspect however, in view of the data above, that I have misunderstood & may have mis-quoted that reference. An iron cargo ship, brig rigged. Per 1 (Lloyd's Register data, Nile, ref. 1875), 2 (Miramar, link, you now must be registered to access). 211.9 ft. long, single screw, signal letters HNDT. Built for 'John A. Dunkerley and Co.' ('Dunkerley'), of Hull, a long established company (have seen an 1847 ref.) which served Scandinavian ports & the Baltic. I now read that Mercantile (see below) named its ships after world rivers, hence the Nile. So I presume there was a relationship between Dunkerley & Mercantile. Dunkerley, I see, managed ships for others also. The vessel was re-engined, in 1873, with compound machinery provided by C. D. Holmes & Co., of Hull. Dunkerley & Mercantile Steamship Co. Limited, ('Mercantile') of London, would seem to have jointly owned Nile in 1874/75 & in 1880/81 (do I understand the Lloyd's references correctly? - at left. Incidentally, I cannot spot the vessel in Lloyd's Registers prior to 1874/75). We thank Ted Nutt, for providing most of the information in this listing. Ted advises, however, that in 1875 the vessel was transferred 100% to Mercantile who owned it presumably until the end. Confirmed in part by the Mercantile Navy List of 1880 - which states that the vessel was then owned by 'The Mercantile S. S. Co. Ltd.' of London. In 1881, either at Oct. 10 or Nov. 13, the vessel left Shields for Kronstadt (30 km. W. of Saint Petersburg, Russia) & went missing. While the WWW record for this ship & its loss is essentially non-existent, Brian Curtis advises (thanks Brian!) that the vessel in fact left Shields with a cargo of coal on Oct. 13, 1881 under the command of William G. Curtis, with a crew of 18. The vessel is believed to have been lost in severe storms on the following day. William Curtis was Brian's great grandfather. Can you help with more data? Now I have also read, in a Google data 'snippet', that in the 1870s, Dunkerley 'passed over' its ships to Newcastle Steam Shipping Co. I suspect however, in view of the data above, that I have misunderstood & may have mis-quoted that reference. An iron immigrant sailing ship, perhaps. Per 1 (data, Durham, the 2nd Durham near page bottom), 2 (Naval Court inquiry at Valparaiso, ref. 1720, ex 3), 4 (Miramar, link, you now must be registered to access). 198.6 ft. long, signal letters WQNH. Cemented in 1866. In 1867 owned by John Temperley of Cornhill, London. Damaged & repaired in 1870. Soon, certainly in 1872, the vessel was owned by Temperley & Co. of London. However, the vessel seems not to be referenced on this 'Temperley' fleet page. Link 1 refers to voyages to India & New Zealand. So this page (Merkara about 50% down) might possibly relate. Other owners? In 1880 the vessel was owned by Henry W. Carter of London & in 1882/83 by Temperleys, Carter & Darke. I see that Miramar now states that the vessel was lost in the S. Atlantic due to fire on Jan. 3, 1883 when 25 miles SE of Staten Island. Thanks for that data, Miramar! It surely makes sense since Lloyd's Register of 1882/83 (image at left) states the vessel to have been abandoned. Now that is not Staten Island, New York, rather Isla de los Estados, known as Staten Island, located off the coast of Tierra del Fuego, Argentina. A Naval Court inquiry into the loss (Inquiry #1720) was held on Jan. 26, 1883 at Valparaiso, Chile, the loss being stated as having been on Jan. 4, 1883. No blame was attributed to the captain & the abandonment was considered justifiable. Can anybody provide any additional detail re her loss (the official inquiry text would surely help) or otherwise provide more data? An iron cargo ship. Per 1 (data), 2 (Quebec Steamship Co., Flamborough), 3 (Miramar, link, you now must be registered to access). Only limited data is available re this vessel. 198.7 ft. long, signal letters HTFP. Built for 'J. Livesay' of Sunderland (1870 of London) for service from Sunderland to Halifax, Nova Scotia, Canada. Per the Lloyd's Registers, J. Livesay owned the vessel thru 1872/73 but from 1873/74 no owner name is indicated. From 1876/77 the registers state Quebec & Gulf Ports Steamships Co., of Quebec, Quebec, Canada, (or per the Mercantile Navy List of 1880 The Quebec & Gulf Ports S. S. Co.) to be the vessel's owner. Rebuilt in 1878. Became owned by Quebec Steamship Co. (or Steam Ship) from 1880/81 thru 1889/90, the last edition of Lloyd's Register that the webmaster has available. I read however, that in 1888, the vessel was registered at Hamilton, Bermuda, still in the name of Quebec Steamship Co. It was still registered there in 1900, but then was owned by Richard Williams, jun. of Cheshire, England. He would seem to have bought the vessel in 1896. Note that much of the above data differs from the data at 1 which states the vessel to have been owned in 1867 by Sandford Fletcher (Dominion Line of Steamers). And in 1870 by Montreal & Maritime Provinces Steamship Line. Quebec & Gulf Ports Steamship Co. are stated to have been the owners but from 1875. Initially in service from Montreal, Quebec to the Maritimes but based at New York c. 1877. The vessel would seem to have been frozen in at Charlottetown, Prince Edward Island, Canada, in the winter of 1871/2. And stranded on Jul. 29, 1876 at Bonaventure Island, below Quebec City & re-floated. What eventually happened to her, I wonder. Can you help with more data and/or an image? A 3-masted iron ship, later a barque. Per 1 (fine data page, image), 2 (extensive wreck & history data), 3 (data & tiny image thanks to William L. Trotter, an illustrator, probably ex 'Thirty Florida Shipwrecks', published 1992), 4 ('pdf' wreck data), 5 (Lloyd's Register data Lofthus), 6 (page featuring Apl. 2015 wreck images), 7 (2003 & 2005 photo sets of wreck available), 8 (a fine 'Peter Schulz' wreck image (thanks so much Peter!) ex link 7), 9 (repeat of modest image of wreck aground), 10 ('wrecksite.eu' Lofthus wreck data), 11 (Miramar, link, you now must be registered to access). The above links & this summary are repetitive! Someday soon, I should summarise such Lloyd's Register data from 1868/69 as is available to the webmaster. 222.8 ft. long, signal letters JHDR. Built for De Wolf & Co., later, in 1870, J. S. & J. R. De Wolf, both of Liverpool, (the identical text at many of the above links states Liverpool Shipping Company, of Liverpool, with H. Fernie & Sons the managers). Note that the Mercantile Navy List of 1880 records H. Fernie as the vessel's then owner & David Hernie in 1890, both of Liverpool. Engaged in the East Indian trade & accordingly sported false gun ports to (hopefully) ward off far east pirates, a common practice at the time, it would seem. The vessel was given a new deck in 1890. And, I presume, was damaged in some way in 1893 which necessitated repairs. The vessel was sold in 1897 to 'Barque Lofthus Actierederi', of Lillesand, Norway, (J. A. Henschien, manager), registered at Lillesand, & renamed Lofthus. Used in the American trade. On Feb. 4, 1898, while en route with a cargo of lumber from Pensacola, Florida, to Buenos Aires, Argentina, Lofthus (Captain Fromberg in command) was blown off course & driven high onto the beach at Boynton Beach, N. of Ft. Lauderdale, on the Florida east coast (off Manalapan). The vessel was a total loss but the crew of 16 & the ship's dog & cat were all saved. The dog & cat received immigrant status! - the captain gave them both to a local family. Three Friends, (a tug more normally engaged in running guns to Cuba! ), offered assistance but could do little to save her. The vessel was stripped of its usable items & then sold for $1,000 for the 800,000 ft. of timber contained in its holds. In Sep. 1898, the vessel suffered the indignity of being blown up with dynamite so the lumber in its hull could also be salvaged. The wreck, today an easy dive site, lies in 15/20 ft of water, 175 yards offshore, in (since 2003) a 'Florida Archaeological Preserve'. Deck beams, an iron mast, hull plates & maybe the bow are still there today. I gather that the anchor was moved from where it was found, to be closer to the wreck site. And now has a commemorative plaque attached to it. Can you help with more data and/or an image? A 3 masted fully rigged iron ship. Per 1 (image, click 'Display item' at right), 2 (Lloyds Register 1869/70), 3 (list of 36 passengers, Aug. 1872 arrival at Victoria, Australia), 4 (Australian newspaper references to vessel), 5 (1890 wreck of Penthesilea ex 6), 7 (Miramar, link, you now must be registered to access). 243.3 ft. long, signal letters JCKP. Built per an expired eBay listing for James MacKnighton, of Liverpool. If so, the vessel must have soon been sold because Lloyds 1868/69 indicates 'Jones & Co.' of Liverpool to be the owner, which, I believe means W. H. & S. Jones & Co. I suspect that the MacKnighton reference is in error. The Mercantile Navy Lists of 1870 & 1880 state William Hen. Jones to be the vessel's then owner. The vessel certainly travelled extensively to Australia. D. Venters was her captain for many years. On Nov. 18, 1873, when at Williamstown (Melbourne), a fire aboard was speedily extinguished. It was feared that major damage had resulted but that would seem not to have been the case. William Dossett, about 16 years old, pleaded guilty to starting the fire & was sentenced to 2 years hard labour. J. M. Joshua was one of a number of vessels which helped put out the fire. The vessel surely carried passengers to Australia. A search at 'Mystic Seaport' indicates that 'Jones' was the owner during years 1875/1882 but in 1883 records W. (William) D. Reid of Liverpool as the owner. It would seem that he previously was her captain. No records there after 1883. The Lloyds Register for 1885/86 indicates that E. S. Jones, also of Liverpool, was then her owner, while in the 1887/88 & 1889/90 editions the ownership had reverted to W. (William) D. Reid. On Jan. 19, 1890, under the command of Captain F. Wilson, & while en route from Newport, Wales, to Mauritius with a cargo of coal, the vessel went ashore in force 10 winds at Baggy Point Rocks, about 15 miles WNW of Barnstable, North Devon (possibly at Saunton Sands). No loss of life. All aboard were rescued by the Braunton lifeboat. The Appledore lifeboat was at the scene also but broke all of its oars in trying to effect a rescue & had to return to land. See 5. Per an eBay item, 'some reports state she was re-floated, but BOT states she became a total loss'. It seems to me that she must have been re-floated, because there is only one Miramar ref. to a vessel of the name & there are Australian references to Penthesilia, which I believe is this vessel, certainly thru 1904. In 1900 the vessel was owned by Walter de Wolf (managing owner) & associates, of Liverpool. On Aug. 14, 1903, during a gale, Electra, a ketch, smashed into Penthesilia at Adelaide & lost its mainmast as a result. Penthesilia was at Fremantle in Aug. 1903 & at Newcastle, New South Wales, in Jun. 1904. 'Recent to' Apl. 18, 1901, the ship was in a collision (where?) with steamer Hinemoa. What eventually happened to Penthesilea/Penthesilia? A long gone eBay item advised us that the vessel was 'lost, whilst engaged in the timber trade, near Puget Sound (Washington State NW USA) in heavy weather in 1904.' Can you correct the above data and/or add anything? An iron barque. Per 1 (a 'doc' file in Norwegian #513 Edel), 2 (link 1 translated, #513), 3 (data Edel, ex 4), 5 (extensive page in Norwegian, image, re Edel), 6 (Miramar, link, you now must be registered to access). 215.5 ft. long, signal letters WHKB later KDRV. Built for Saunders & Co. of Liverpool. Lloyd's Register of 1872/73 states Merchant Shipping Co. Ltd., of London, to be the new owner. The vessel was sold, in 1888, to 'Conrad Paulsen' of Elsfleth, Germany. And sold again, in 1903, to 'Fr. Johannessen', also of Elsfleth. In May 1907, the vessel was sold to 'A/S Sand�i', C. A. or A. C. Olsen, V. Sand�y, the managers, of Tvedestrand, Norway, & renamed Sand�i. In Sep. 1915, the vessel was sold once more, to 'A/S Edel', of Skien, Norway, H. T. Realfsen, the manager, & renamed Edel. In 1917, the vessel was sold for the last time, to 'Skibs-A/S Sand�' of Kristiansand, Norway, with Christiansand Shipping Co. Ltd. the manager. On Nov. 30, 1920, the vessel lost rigging & had its hull damaged while en route from Norfolk, Virginia to Bordeaux, France with a cargo of coal. On Dec 20, 1920, the vessel put into St. Thomas, Virgin Islands, to effect repairs. Either in 1920 or on May 11, 1921, the vessel was condemned. The webmaster regrets his inability in Norwegian. He has tried to report correctly the available data. A site that appears no longer to be available seemed to indicate that the vessel went all over the world in the years of 1907 thru 1913. Can you correct the above data or add anything? A composite clipper which later became a barque. An immigrant ship. Per 1 (55% down), 2 (Shaw Savill), 3 (Sep. 24, 1875 to New Zealand ('NZ'), 4 (image), 5 (1872 voyage to Lyttleton, NZ, & data), 6 (1876 voyage to Lyttleton). 7 (1879 voyage, then rigged as a barque, sinking report), 8 (an 1870 passenger ticket, how interesting! 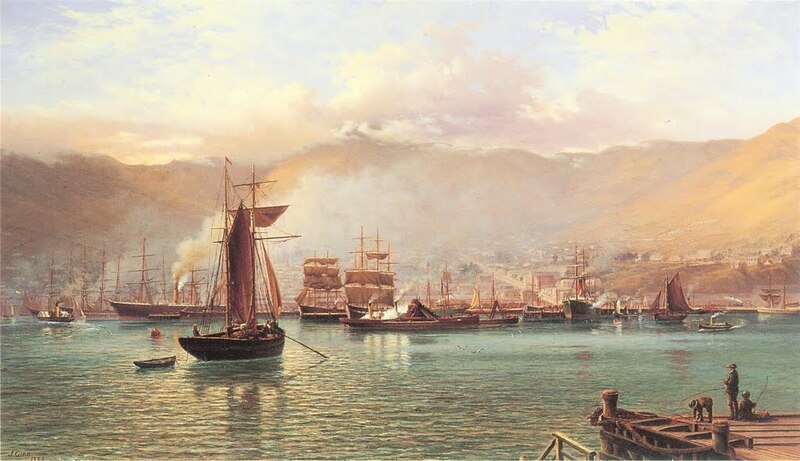 ), 9 (1870 voyage), 10 [A truly fine painting of Lyttleton in 1886, by John Gibb (1831/1909)], 11 (Miramar, link, you now must be registered to access). 203 ft. 3 in. long. Built for Shaw, Savill & Co. In 1882 the vessel was transferred to 'Shaw, Savill and Albion Co.' or maybe 'Shaw, Savill and Albion Co. (Limited)'. Made 18 voyages to NZ, including 12 to Lyttleton, one at least of which was under charter to NZ Shipping Company. She mostly sailed from East India Dock in London, but 2 voyages departed from Glasgow. In 1871/5 the vessel carried 'assisted immigrants' to NZ. One voyage (3): arrived at Timaru, NZ, on Sep. 24, 1875 with 264 passengers ex London, 84 days out from Plymouth. On Apl. 4 (or 11), 1890, returning on her 19th voyage, under the command of Captain Thomas, she left Wellington, NZ, for London, with a cargo of wool, tallow & flax. On Jun. 26/27, 1890, the cargo 'fired spontaneously'. The fire spread quickly; the vessel had to be abandoned; only 2 boats could be launched. Where did it happen? 'Off the Western Islands'. I have read off the River Plate, but have also read nearing the Azores, which seems to be the correct version. The Azores were known as the 'Western Islands'. At 40.56N/32.26W. On Jun. 26, 1890, vessel was 'burnt nearly to the water's edge'. The words re the rescue efforts are most confusing to the webmaster. It would seem that the crew was rescued by either Servia or Servantia, bound for Hull, which landed the Captain & 11 crew at Deal, Kent, on Jul. 14, 1890. But 7 of the crew were transferred from that vessel to Blue, or W. F. Babock, an American vessel bound from San Francisco to Liverpool & presumably landed there. No passengers aboard & no lives lost. A litho of the vessel exists, by T. G. Dutton. Can you correct the above data or add anything? An iron passenger/cargo ship. Per 1 (Baltic Lloyd), 2 & 3 (same data), 4 (Miramar, link, you now must be registered to access). 282 ft. long, one funnel, two masts, speed of 12 knots. With a 'clipper stem'. Built for 'Baltischer Lloyd' or 'Baltischer Lloyd-Stettin-Amerikanische Dampfs AG' (Baltic Lloyd), of Stettin, Germany, (& German registered), which company would appear to have gone into liquidation on Apl. 25, 1876. Her maiden voyage, from Stettin to New York via Copenhagen, Denmark, commenced on Aug. 8, 1871. 14 voyages on that service, the last being in Jul. 1874. Later that year she was sold to 'Raffaele Rubattino' of Genoa, Italy, & renamed Batavia. Webmaster's guess! 'Rubattino' ran steamers to India, Singapore and Indonesia. This vessel, in view of its name, was probably used on that service. Why do I say that? Because Indonesia used to be known as Batavia. 'Rubattino' together with I. & V. Florio, of Palermo, Italy, later formed 'Navigazione Generale Italiana'. On Nov. 23, 1877, Batavia was wrecked on 'Capy Shoals' nr. Ile Jaire, Marseilles, France while en route from Bombay, India, to Marseilles with a cargo of cotton & passengers. I cannot see that the vessel was listed in Lloyd's Register, in either name. Can you help any? Maybe confirm or deny my guess! An iron passenger/cargo ship. Per 1 (Baltic Lloyd), 2 & 3 (both the same data), 4 (Sumatra), 5 (Miramar, link, you now must be registered to access). 294.0 ft. long (per Lloyd's Register of 1878/79, have also read 282 ft.), one funnel, two masts, speed of 11 knots, signal letters SKJP. With a 'clipper stem'. Built for 'Baltischer Lloyd' (Baltic Lloyd), of Stettin, Germany, (& German registered), which company would appear to have gone into liquidation on Apl. 25, 1876. Her maiden voyage, from Stettin to New York via Copenhagen, Denmark, & Christiansand, Norway, commenced on Jun. 27, 1871. She arrived at New York on Jul. 16, 1871 with 655 passengers. 15 transatlantic voyages, the last commencing Jul. 9, 1874 (Stettin to New York via Antwerp, Belgium, & return). Later that year she was sold to 'Raffaele Rubattino', of Genoa, Italy, & renamed Sumatra. 'Rubattino' ran steamers to India, Singapore & Indonesia. This vessel, in view of its name, was probably used on that service. 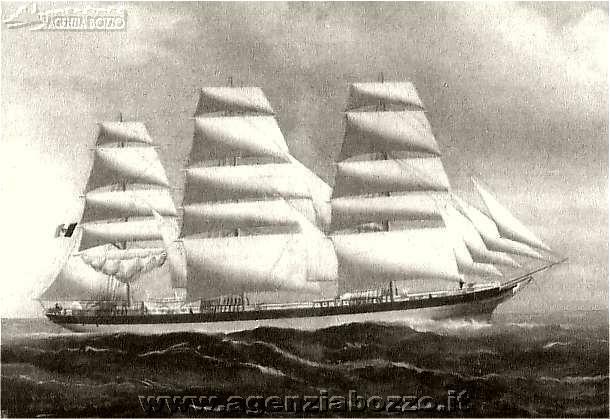 In 1880, the vessel was transferred to 'Societ� per la Navigazione a Vapore Raffaele Rubattino', also of Genoa. In 1881, the vessel was transferred to 'Navigazione Generale Italiana' ('Generale'), formed that year by the amalgamation of 'Rubattino' with I. & V. Florio, of Palermo, Italy. None of those ownership changes seem to be reflected in the Lloyd's Registers available to the webmaster which record 'R. Rubattino & C.' from 1878/79 thru 1885/86 & Generale from 1887/88. In 1910, the vessel was transferred to newly formed 'Societa Nationale del Servizi Marittimiti'. And in 1913, transferred to 'Societa Marittima Italiana', of Genoa. Scrapped in the 3rd quarter of 1923. Can you help any? An image perhaps? A cargo ship, a steamer. Per 1 (1876 collision with Agrigento, ex 2, 3 (limited 1886 sinking story, image, wreck location & newspaper cuttings), 4 (essentially the same data), 5 (First Mate's account of the sinking), 6 (extensive 'Richmond Dispatch' article re the sinking, commencing top left of page), 7 (New York Times fine article, with most names), 8 (Jan. 12, 1886 New York Tribune newspaper article re Hylton Castle sinking), 9 (Fire Island Lighthouse, at lower left in this map), 10 (Miramar, link, you now must be registered to access). 251.0 ft. long, signal letters WQRD. Built for Laws, Cleugh & Co., of North Shields, who were the vessel's registered owner thru 1883/84. An extraordinary disaster happened on Apl. 3, 1876, involving the vessel. Agrigento, owned by The Trinacria Company, left Piraeus, Greece, on Apl. 2, 1876, for Corfu with 30 passengers & a crew of 33 (or maybe 34). Hylton Castle, under the command of J. R. Lascelles, was en route to Constantinople. Early on the morning of Apl. 3, 1876, both ships were off Cape St. Angelo/Cape Malea, approaching one another. Hylton Castle struck Agrigento amidships with very great force. Agrigento's boiler exploded killing 5 crew members, but, worse than that, Agrigento sank within about 10 minutes. There was, it would seem, mass confusion aboard Agrigento. None of its boats were launched, panic ensued, & as a result 29 lives including women & children were lost. Do read the story at 1. A Greek Vice-Consul, a passenger aboard Agrigento, was published in a Greek newspaper as saying that Hylton Castle i) changed course & caused the accident, ii) kept on her course after the collision, & iii) intended to continue on to the Dardanelles. Further that that her crew were intoxicated & could not launch any boats. Per that Vice-Consul, it was Agrigento crew members, who had clambered aboard Hylton Castle at the time of the collision (15 of them did), who forced Hylton Castle with axes & knives, to return to the scene. Lascelles disputed all of that. And two Agrigento passengers, one American & one Greek, close witnesses to the events & to the conduct of Lascelles & his crew, supported Lascelles. Per such witnesses, the Hylton Castle crew were not intoxicated, the ship did return & further did all that was possible to effect rescues in the circumstances. Hylton Castle returned with the survivors to Piraeus, where the ship was supposedly seized by the Archangel Insurance Company. Alas, I cannot tell you what really happened nor what later happened. Surely there must have been an Inquiry. I have read, however, that Captain Lascelles was tried for manslaughter, but was acquitted. And that the owners of Agrigento took action against the owners of Hylton Castle for the loss of their ship. Can anybody tell us if there was, in fact, a Court of Inquiry, & if so tell us of its findings. Or otherwise add to this extraordinary story. The vessel was chartered, I have read, for a period of 3 years thru 1883 to R. Dunsmuir of Nanaimo, British Columbia ('BC'), Canada, for use in the coal trade. The vessel arrived at Victoria, BC, from the U.K. in 1880. The vessel returned to U.K. waters at the end of that charter. By 1885/86, the owner had become Laws, Surtees & Co., also of North Shields (G. A. Laws & R. W. Surtees). I read that in 1886 the vessel was owned by Surtees & Co., of North Shields (but I believe that to be incorrect and that it was still owned by Laws, Surtees & Co. as registered), when, at about 8 p.m. on Friday Jan. 8, 1886, the vessel encountered a heavy & violent snow storm off Long Island, New York, when en route from New York to Rouen, France, with a cargo of maize (corn) - 57,880 bushels it would appear. The vessel would seem to have been overloaded, though Captain Colvin, her captain, denied it was so. In hurricane force winds, the vessel sprang a leak, everything on deck including the tarpaulins were ripped off, the ship became ice-covered & water entered the holds. The crew attempted without success to get the vessel safely back to port. All power was lost when the water reached the engine room. The wet grain swelled & the pressure literally broke the vessel apart even though iron hulled. This all took place over a number of days - the vessel's stern rose high in the air & the vessel sank, bow first, at about 9 a.m. on Monday, Jan. 11, 1886, 2 1/2 days after the storm had hit. It sank 15 miles SE of Fire Island Lighthouse, S. of Long Island, New York, U.S.A., at or about 40.33N/72.51W. The crew of 22 abandoned the vessel & took to the lifeboats, initially 8 in a boat commanded by Chief Mate John R. Marshall & 14 in a larger second boat commanded by Captain Colvin (his first name?). It was soon determined that the captain's boat was overloaded & 2 men were transferred from the captain's boat to John Marshall's boat. The first boat, now with a total of 10 men aboard, made it safely to land, 5 miles E. of the lighthouse. Both boats witnessed Hylton Castle vanishing under the surface. The second boat, commanded by Captain Colvin, now with a total of 12 men aboard, lost all but two oars & ended up at sea for three more days. Eventually, frostbitten & coated head to toe in ice, they reached a fishing smack at anchor - Stephen Woolsey, commanded by N. S. Keeney. The smack took the Hylton Castle crew aboard, took their lifeboat in tow & headed W. to near Sandy Hook. The survivors were soon taken aboard Millard, a tug, & landed at Castle Garden, S. tip of Manhattan. So no loss of life, though a harrowing experience for all concerned - freezing & frostbitten in the high seas. And for those that made shore an awful long freezing trek to safety. Remains of the wreck are still on the seabed, 100 ft. below the surface, now the home of lobsters. A dive site today. 5 advises us that the wreck was, in fact, dynamited to reduce its danger to shipping. Anything you can add? An iron cargo ship, with 2 masts, brigantine rigged. Per 1 (data, dive images, etc. ), 2 (map with Shag Rock marked), 3 ('pdf' file, Apl. 1881 London wreck inquiry), 4 (data, images, & later career of Cousins), 5 (extensive data), 6 (data, Kingston), 7 (diving images), 8 (French 2-page 'pdf' re wreck, thanks to Laurence Verjus), 9 (Miramar, link, you now must be registered to access). 79.9 metres long perpendicular to perpendicular, 262.2 ft., speed of 11 knots, signal letters KMCT. The webmaster has a few editions of Lloyd's Register available to him from 'Google' books - see left. The vessel was built for 'Mutual Steam Shipping Co.', of London. By the 1876/77 edition of Lloyd's, the vessel was owned by 'Commercial Steamship Company Limited' ('Commercial'), of London & registered there. John S. (Sheriff) Hill was the ship's managing owner. She was re-boilered in 1878, I read. On Jan. 20, 1881, with Captain Thomas R. (Richard) Cousins in command, the vessel left Cardiff, Wales, with a cargo of coal & a crew of 25, bound for Aden via the Suez Canal. She passed through the Suez Canal safely, leaving it early on Feb. 16, 1881 & proceeded S. through the Gulf of Suez until just before midnight that day when she ran aground at Shag Rock (Sha'ab Ali Reef). On the eastern shore of the Gulf. The night was clear, the sea was calm. At 27.46.42N/33.52.36E. At the SW corner of the rock. Quite close, in fact, to where Thistlegorm later sank. The dates are a matter of confusion to the webmaster. Many references are to the vessel having run aground on Feb. 22, 1881, but the wreck Inquiry report seems to most clearly state Feb. 16, 1881. The crew tried to free the ship & jettisoned 60 or 70 tons of coal to assist in the effort. F. W. Ward came upon the scene, offered to take off the crew but did not offer a tow. Columbian came by later, did provide a tow but was unsuccessful in the attempt. Freeing the ship being considered now impossible, 17 crew members were taken aboard Almora on Feb. 19, 1881. The Master & the remaining 7 crew members left the ship by boat on the evening of Feb. 20, 1881 & made it to Jubal Island (on the W. coast of the Gulf of Suez). They ran short of water, it would appear, & headed out into the Red Sea again where Strathmore rescued them on Feb. 24, 1881 & landed them at Suez. The ship? It slipped backwards off the reef & sank - into 14 to 20 metres of water. On Feb. 20, 1881 or maybe later. Declared a constructive total loss on Feb. 28, 1881. No loss of life. There was an inquiry into the sinking & Cousins was found to have neglected proper navigation. Though he had, by the time of the Inquiry, already been suspended for 2 months by Commercial, his master's certificate was suspended for a further 6 months, during which period the court recommended that he be allowed a first mate's certificate. The second officer bore part of the blame. I read, how very interesting, that Cousins later was given command of Harvest in Oct. 1881 & ran her aground twice that year. And he ran it aground again a year later. No further mishaps (gratefully!) in the balance of his career. The wreck was not identified until quite recently & while found but unidentified was known as 'Sarah H'. The vessel would seem to be in good condition considering its age & the corals are said to very fine. Remains of an older wreck seem to lie under her starboard side. A dive site today. Can you add anything? A steamship, a passenger ship that became a cargo ship & had a short & difficult life. Per 1 (launch of Dhoolia, ex Mechanics Magazine of 1872), 2 (data re Dhoolia, ex Nautical Magazine 1872, p#1043), 3 ('pdf' file, Court of Inquiry re 1876 sinking), 4 (summary of the Court hearing), 5 (loss report at line 56), 6 (Miramar, link, you now must be registered to access). 330.8 ft. long (100.83 metres) perpendicular to perpendicular, signal letters WRJS, 350 HP engines by Oswald & Co. of Sunderland, launched Jun. 22, 1872, then the largest ship ever built on the River Wear. Schooner rigged with three masts & with passenger accommodation most luxurious (with a dining table 50 ft. long & punkahs). Dhoolia? Not sure exactly where it is located in India, but it is 215 miles from Bombay, today's Mumbai. The webmaster has a few editions of Lloyd's Register available to him from 'Google' books - see left. The vessel was built for C. M. Norwood & Co. of Hull, intended for their 'Red Cross Line' of Calcutta (now Kolkata), India, passenger trade between England & Calcutta, via the Suez canal. In Sep. 1873, the vessel ran aground in the Red Sea, en route to India, & 'sustained very considerable damage to her bottom'. The vessel was then sold, to Hill, Smith & Co. of Hull, brought to Hull & there repaired by Earle's Shipbuilding and Engineering Company. At considerable expense it would appear. Captain Hill, presumably the 'Hill' of Hill, Smith & Co., stated that the cost of acquisition & repair amounted to about �14,000. The vessel voyaged to Calcutta & Colombo (Ceylon, now Sri Lanka) but en route, in Apl. 1875, the vessel grounded again, this time in the Suez canal. She was not seriously damaged, completed her voyage & upon return to Hull was again repaired. There would seem to be no possibility that these groundings & repairs made her any the less seaworthy, all repairs being completed quite properly. The vessel made 2 voyages to New Orleans, U.S.A., a voyage to Odessa in southern Ukraine, & two to Alexandria, Egypt, likely returning with grain. On Dec. 3, 1876 the vessel left Alexandria for Hull, with 2800 tons of cargo, largely cotton seed & barley & also wheat & beans. John H. (Henry) Stephens was in command with a crew all told of 43. On Dec. 11, 1876, the ship lost the use on one of her boilers due to the action or perhaps inaction of Henry Dibb, the 2nd engineer. The ship left Gibraltar on Dec. 17, 1876, & encountered strong head seas & high winds, soon a major gale, after rounding Cape St. Vincent. I must direct you to the Court record above (3) for the blow-by-blow of what then happened, but in a nutshell, heavy seas broke over the ship on the evening of Dec. 22, 1876. Those raging seas broke open the doors to the officers' berths, & broke thru a wooden bulkhead between those quarters & the very large engine room hatchway. The water cascaded down into the engine room. The crew did what they could to repair the bulkhead & keep the ship in as safe as possible a position relative to the seas. Steering chains broke & steering had to be done from the aft wheel. The water continued to pour in, the boilers became extinguished & the ship wallowed. By 8:30 a.m. on Dec. 23, 1876, there was 10 or 11 feet of water in the engine room. Malta (not sure which one) arrived on the scene & the crew left the ship, some at 9:30 a.m. & others later, I think, but am not sure, via Malta's boats. The Captain & the donkey-man were the last to leave at 2:30 p.m. that day when there were 16 to 17 feet of water in the engine room. The ship foundered during the night, at or about 43.26N/9.30W, close to the NW tip of Spain. Malta continued with her voyage to Corunna, (I presume A Coru�a in Spain), & in due course landed all of the crew except one, back in England. So no loss of life. The conclusion of the Court was that had the bulkhead been of iron rather than wood, the ship would likely have survived the storm. In the future no ship with such a bulkhead would ever get surveyor approved. The master & crew were commended for their actions throughout except for Henry Dibb, whose licence was cancelled for neglect of duty & drunkenness. Can you add to and/or correct the above? A passenger/cargo ship. Per 1 (Baltic Lloyd), 2 (Ernst Moritz Arndt), 3 (Habana), 4 (modest image of Habana), 5 (Miramar, link, you now must be registered to access). 317.0 ft. long, one funnel, two masts, speed of 12 knots, signal letters QPBH. Built for 'Baltischer Lloyd' (Baltic Lloyd), of Stettin, Germany, (& German registered), which company would appear to have gone into liquidation on Apl. 25, 1876. Her maiden voyage was from London to New York via Le Havre, France, on Feb. 2, 1873. Six transatlantic voyages, the last being Stettin to New York via Antwerp, Belgium, on May 28, 1874. In 1879, the vessel was sold to 'A. L�pez Y Compa�ia', of Barcelona, Spain, & renamed Habana. It was sold again, in 1881, to 'Compa�ia Trasatl�ntica Espa�ola', which company in 1886/1896, & maybe before, served the New York to Havana, Cuba, route. Lloyd's Register of 1882/83 states 'Delegacion de la Cia Trasatl�ntica' of Barcelona to be her registered owner. The vessel was used on the New York to Havana route. Habana was scrapped at Genoa, Italy, in the 3rd quarter of 1900. Can you help any? A passenger/cargo ship or cargo/passenger ship. Per 1 (page bottom), 2 (ref. ), 3 (85% down page), 4 (NY Times archive re 1873 wreck), 5 (possibly 2 ref. to Thorwaldsen's passengers arriving at New York in 1873), 6 (Miramar, link, you now must be registered to access). 319 ft. long. Built for Baltischer Lloyd (Baltic Lloyd), of Stettin, Germany. Clearly used in the Transatlantic passenger trade to North America & carried cargo also. Had a very short life, it would seem, since on Apl. 4, 1873, while en route from New York to Copenhagen, Denmark & on to Stettin, the vessel ran aground & was wrecked at Toreko (Torekov today? ), on the SW coast of Sweden (at 56.26N/12.30E). The vessel was 50 miles off the normal course for shipping entering Sk�lderviken Sound there, if, that is, she was attempting to do that. Copenhagen is not very far to the south & she may have just been off course. No loss of life. 4 lists her most interesting cargo, which included 17 packages of whalebone, 213 'reapers' & '500 barrels extract of logwood', whatever that is. Do read the list! The article does not mention how many passengers she was carrying. 5 refers to 128 Thorwaldson passengers having arrived at New York. Can you add anything? A cargo ship. Per 1 (data, Zulu), 2 (Union Steamship Co.), 3 (Miramar, link, you now must be registered to access). Launched as Zanzibar. 224.7 ft. long. The vessel was completed on Nov. 16, 1872 & acquired by Union Steamship Company Ltd., of Southampton, as Zulu. From the names we may conclude it was intended to serve South Africa ('SA') & indeed the vessel provided 'intercontinental mail service' to SA &, per 2, provided SA coastal service. Per 3, the vessel was sold, in 1877, to 'Solomon Ezekial' of London (or maybe, per 1 to David Sassoon & Co.). It sailed, it would seem, to Bombay, India, ex Southampton & Cardiff. On Jul. 31, 1877, likely on her first run under new ownership & while en route from Cardiff to Bombay with a cargo of coal, Zulu was wrecked at Foz do Azelho, 20 miles NE of Peniche, Portugal (I think). That's all for now! Need help! A cargo ship. Per 1 [Royal Mail Steam Packet Co., Severn (2)], 2 ('pdf', 1879 collision with Edinburgh), 3 ('wrecksite.eu', wreck Turc), 4 (dive site, data & images, Turc), 6 (Miramar, link, you now must be registered to access). 281.5 ft. long, signal letters MFBV. The vessel was owned by Royal Mail Steam Packet Co., of London, from 1873 to 1887. On Mar. 12, 1879, Severn, Captain Lawson in command, was en route from Hamburg, Germany, to Southampton, U.K., with 5 passengers & a crew of 49. At midnight on Mar. 13, the vessel was in the vicinity of Dungeness, Kent, headed west. Also in the vicinity was Edinburgh, a 62 ton sailing pilot cutter out of Dover, with a crew of 8 & 12 pilots aboard. At 12:20 a.m. on Mar. 14, 1879, Severn struck Edinburgh's starboard bow at nearly a right angle. Edinburgh sank quickly. Severn launched its boats but 15 aboard Edinburgh, being 5 crew & 10 pilots, were lost. The Court determined that responsibility for the collision was shared between the vessels. However the 2nd officer of Severn, Clement J. (James) Bateman, had his licence suspended for 6 months for failing to keep a proper lookout, for failure to reduce speed etc. You can read all of the details at 2. Per 6, the vessel was, in 1887, sold to 'Karamanyan Sahinoglu ve Ortaklari', of Istanbul, Turkey, & renamed Tunc. But it would seem, per Lloyd's Register at left, that Turc is the correct spelling of the vessel's new name. 6 also advises that the vessel was sold again, in 1888, to Idare-i Mahsusa, also of Istanbul, which appears correctly (also left) to have been 'Idarei Massousieh' of Istanbul (Constantinople). On May 19, 1895, Turc was wrecked on Abu Madafi Reef, about 40 miles N. of Jeddah in the Red Sea - at 22.03N/38.45E. Can anybody advise us of the wreck circumstances? Or otherwise correct or add to the above text? A cargo ship. Per 1 [M�ller, Caledonia (3)], 2 (Miramar, link, you now must be registered to access). 231.5 ft. long, later 228.5 ft, signal letters WSPD, later NHPD, 99 HP later 126 HP. Built for 'Burrell & Son' of Glasgow. This page states that Robert Donaldson, of Glasgow, was the owner in 1880, which data is not confirmed by Lloyd's Register ('LR') of 1880/81 but is confirmed by the Mercantile Navy List of 1880. In 1889, the vessel was sold to 'London & Rotterdam Steam Ship Co. Ltd.', of London, with, in 1890 at least, Joseph Owen the manager. 1 indicates that in 1898 the vessel, then owned by 'London Rotterdam Steamship Co.', was sold to 'Wm. H. Muller & Co.', of Rotterdam, & renamed Caledonia. Miramar refer to that sale & also to a later transfer, in 1901, to 'Wm. H. Muller & Co.'s Algemeene Scheepvaart Mij', also of Rotterdam. LR of 1911/12 lists 'W. H. M�ller & Co.'s Algemeene Scheep Maats' as her then owners with 'W. H. M�ller & Co.' the managers. The vessel was apparently re-engined in 1908 with the original engines by T. R. Oswald being replaced with engines by Amos & Smith of Hull. And was scrapped at Ghent, Belgium, in 1928. Can you add anything? An iron sailing ship. Per 1 (text and image 20% down), 2 (1880-1881, 80% down page), 3 (Jarlen, data ex 4 a 'doc' file, #47), 5 (Nourse, Foyle ), 6 (Miramar, link, you now must be registered to access). Built for Nourse Line (James Nourse 1828/1897), of London. 243.0 ft. long, signal letters PDMQ, later KBMP. Initially registered at London. An eBay item described the vessel as a 'full-rigger main skysail yarder'. On May 19, 1897, the vessel was transferred to C. A. Hampton & E. Bromehead, of London. The vessel was sold, in 1899, to C. H. Hampton & E. Bromehead (both sentences are correct? My distant memory thinks that I have read somewhere that Hampton/Bromehead were creditors or maybe executors of the James Nourse estate). The vessel was sold, in 1903, to 'A. F. Klaveness m.fl. ', of Sv�rdstad/Sandefjord, Norway & renamed Jarlen. In 1904 it was taken over by A. F. Klaveness & Co., of Sandefjord, Norway. 1908 - Unable to translate the following 'Overf�rt til reg. i Kristiania' ('overf�rt' means attack or raid). On Jun. 16, 1908, the vessel left Lobos de Tierra, Peru, bound for Antwerp with a cargo of guano. The vessel was never heard from again, it disappeared with all hands. 20 lives were lost. Can you help any, perhaps with the above translation from Norwegian? A 3-masted iron fully-rigged sailing ship. Per 1 (30% down, with image), 2 (Lloyd's Register data, Bann), 3 (Nourse Line), 4 (data, including Nourse routes), 5 (nr. bottom, labourers India to British Guiana), 6 & 7 (images, Bann), 8 (image, Hildedgard), 9 (Miramar, link, you now must be registered to access). 250.1 ft. long, signal letters PDML. Built for James Nourse (1828/1897), of London. The vessel clearly travelled to Australia. Interesting data at link 5, as follows 'Nourse's established service was Europe to Calcutta with salt or railway iron. From there, a cargo of rice and a party of coolies would be picked up for non-stop transport to the West Indies, followed by a passage (usually in ballast) to the east coast of North America where grain or case oil was loaded for Europe. London - Calcutta - Australia voyages were also made and possibly London - Australia direct.' On May 19, 1897, the vessel was transferred (see words re Foyle above) to C. A. Hampton & E. Bromehead, of London, & on Mar. 20, 1903, was sold or maybe transferred or reverted to 'James Nourse Ltd.', also of London. In 1904, the vessel was sold to 'O. D. Ahlers', of Bremen, Germany, & renamed Hildegard. In 1911, the vessel became a coal hulk at Port of Spain, Trinidad. Can you add anything? An iron full-rigged sailing ship. Per 1 & 2 (identical refs., Hospodar), 3 & 4 (Algoa Bay 1902 storm), 5 (NY Times, 1889/90 voyage to San Francisco), 6 (Miramar, link, you now must be registered to access). 249.8 ft. long (76.1 metres), signal letters PFRG. Built for J. Hargrove, of Liverpool or maybe instead for 'Hargrove, Ferguson & Jackson', see left. Likely the vessel was owned, in fact, by many individual owners with J. (John) Hargrove being the managing owner. Later, from 1882/83, 'Hargrove & Hellon'. I thank Stephen Davies, Museum Director of the Hong Kong Maritime Museum, for his assistance re this listing. He advises that his museum contains 4 James Imray 'blueback' charts of the vessel's 1881/84 circle voyage from Liverpool to China via S. America, Australia & the U.S. At a date between 1882 & 1885, the vessel was sold, to Gavin B. Millar, of Glasgow, but the vessel was still registered at Liverpool. On Jun. 27, 1889, the vessel left London bound for San Francisco. The voyage was not routine & she arrived at San Francisco only 474 days later, then the longest recorded passage between the two ports. The vessel had arrived at Rio de Janeiro ('Rio'), Brazil, at the end of Dec. 1889, in a dismasted condition & with the captain sick. The Captain (L. Lloyd) returned to England (with the ship's log), J. Thomason, the ship's mate, took command, & the vessel was refitted with rigging sent out from England. In 1890, Daniel S. Hellon, of Liverpool, was the managing owner. On Mar. 18, 1890 the vessel left Rio for San Francisco, & arrived there (via Valparaiso, Chile), on Oct. 16, 1890. I wonder what her cargo was? Hopefully not perishable! In 1898 the vessel was sold, to Hargrove & Fraser (the Hargrove name again), however Fraser, i.e. James T. Fraser, was the managing owner. In 1901, it was sold to 'Russo Bros.' of Sorrento, Naples, Italy, (have also read Castellamare, nr. Naples, Italy) & renamed Cavaliere Michele Russo. On Aug. 31, 1902, the vessel was at Algoa Bay, nr. Port Elizabeth, S. Africa, having arrived from New South Wales, Australia, with a cargo of coal ex the Burwood Colliery at Newcastle. Half of her cargo was successfully discharged. It & 37 other ships were at anchor when 'the great gale' hit on Aug. 31 & Sep. 1, 1902. The greatest storm ever in a place long noted for its storms. The vessel, & maybe 20 others, were driven ashore & destroyed. If I understood correctly the translation of a now long gone Italian site, 19 crew were aboard Cavaliere Michele Russo at the time & 16 (have also read 17) lost their lives. The Captain, F. (Ferdinando) Russo, was not aboard at the time. I note that the ship's chief officer was named Valentino Lauro - & note also that a couple of reports described the vessel as being a barque rather than a ship. In total, in the storm, maybe more than 60 lives were lost, & 300 or so were rescued. Have also read that 18 vessels were destroyed & 63 lives were lost. A little trivia next! Port Elizabeth was noted for the export of ostrich feathers. Can you add anything? An image? Data about Robert Pace (Oct. 8, 1809/Nov. 17, 1886) is fragmentary. But thanks to a number of parties, & principally thanks to David Elliott, of Gloucestershire, England, & Andrew Pace, from N. of Sydney, New South Wales, Australia, we can advance this 'Pace' listing. Robert Pace came from a large family. A son of Joseph Pace, a sailor from Sedgefield & his wife Mary. Robert had 8 brothers & sisters & two at least of his siblings were baptized at Hartlepool, of interest in view of the shipbuilding association of the 'Pace' & 'Blumer' families. We do know that on Aug. 8, 1831, he married Eleanor Spraggon at Holy Trinity Church in Sunderland. He was, we believe, foreman for George Booth, a shipbuilder at North Sands until 1859 when the Booth family emigrated to New Zealand ('NZ'). During those years he was recorded as a 'Foreman Shipwright' on the birth certificates of three of his children (1853, 1854 & 1858). When the Booths emigrated to NZ, Robert & John Blumer would seem to have set up business together under the name of 'Pace, Blumer'. Robert may have been the senior partner since his name is recorded first? It seems not to be known how long the two were associated but it may have been through 1864 (that is my guess) when John Blumer established a new business at North Dock, & the 'Pace, Blumer' (or whatever then was the true name) North Sands location was taken over by Mr. Joseph L. Thompson. It would seem that Robert Pace (in 1864?) went into business for himself assisted by three of his sons - William who acted as draughtsman & also Robert & Thomas. Witness the following data. David Elliott's research indicates that, per the 'Sunderland Weekly News', Robert Pace began a 350 ton barque in Jan. 1865. In Oct. 1865 he began a 340 ton barque. And in the week of Nov. 17, 1865: 'Launched from the yards of Robert Pace a 9 years barque, 360 tons, measuring 120 feet long, breadth of 27.5 feet, depth of 17.5 feet. Sold to Mr Eggleston of Monkwearmouth. A similar listing in the week ending Apl. 6, 1866 records the launch from Southwick of another '9 years barque' of 418 tons for J & E Lumsden, Sunderland.' The first reference to a named vessel, that David found, was to the Minerva as below. A 9 years barque? Peter Sill, of the U.K., has kindly advised (thanks!) that the '9 years' may well refer to the then typical period of 9 years between complete vessel surveys - required for Lloyds certification. For quite a while, we did not know what later happened to Robert Pace's shipbuilding business. Or indeed, exactly where it was. But David Elliott has now alerted me to 'Reflections of Southwick', a text written in or around 1893 by Luke Crown. On p.8 of the 'pdf' is a paragraph about Robert Pace (1st column of the 3rd page here) which helps clarify the history. It would seem (do correct me if I have misunderstood) that the 'Pace' shipbuilding site was west of the George Clark Engine Works & east of the 'Austin & Mills' yard. On the N. bank of the river of course. About where the Queen Alexandra Bridge was later built, it would appear. The site was then less that perfect, presumably before the river was dredged. '... the stream was not very strong in his favour, and rather shallow, he struck the gound (sic) at last and failed. But it was not for want of perseverance ...'. When the business ended, Robert Pace worked at the North Sands yard of 'Joseph L. Thompson and Sons'. Robert Pace, described as being a very quiet, sedate, religious person, a leader of the free Church, would appear to have lived in Southwick & had, I understand, 12 children, (forgive me if I say that I have some sympathy for Eleanor! ), 2 of whom, both sons named Joseph, did not survive childhood, 3 at least of whom emigrated. 2 daughters went to NZ (Sarah Jane & Eva). And Robert, who was David Elliott's great great grandfather, and also a shipwright, emigrated to the U.S. in the 1880s - to Elizabeth, New Jersey. Isabella, born in 1838, clearly was one of the children who did not emigrate. She married George H. Wrightson, a ship surveyor. And Robert was living with the 'Wrightson' family, at 44 Dock Street, Monkwearmouth Shore, in 1881 & later died at 28 Dean Terrace, in Sunderland, on Nov. 17, 1886, at age 72. His wife Eleanor died about a month after her husband. It is of interest to note that 'David Elliott' & 'Andrew Pace' family traditions both state that the emigration of Robert (one of Robert Pace's sons) to the U.S. was precipitated by a fire at the Pace & Blumer shipyard. That tradition says that the fire took place on a Sunday & that John Blumer (a most religious man) would not allow the fire to be put out on a Sunday. So all was lost. But no date is available for that fire and its existence has not yet been confirmed by contemporary records. David indicates that the Pace family were members of the Salvation Army & speculates that maybe neither party was prepared to tackle any fire on the Sabbath! Andrew confirms that the association of the Pace family with the Salvation Army was very long term indeed, & is so in Australia today (in early 2009). If you can add additional data related to Robert Pace, your contribution would be most welcome. A '9 years barque'. 118.0 ft. long, signal letters MDWJ. From the 'Sunderland Weekly News' for the week ending Aug. 17, 1866 'On Tuesday (14th) Mr Robert Pace launched a 9 years barque, 349 tons register, measuring 118 feet long, 27.5 feet breadth and 17 feet depth, named 'Minerva'. Owners are Kirkwood and Taylorson of Sunderland', though Lloyd's Register ('LR') advises Kirkwood & Co. Peter Sill, of the U.K., has kindly advised (thanks!) that the '9 years' may well refer to the then typical period of 9 years between complete vessel surveys - required for Lloyds certification. The vessel initially intended to trade into the Black Sea, later to the Mediterranean. One register & also the Mercantile Navy List stated that in 1870, Jonathan Taylorson, of Sunderland was the vessel's owner. In 1872/73 Brown & Co., of Sunderland became the vessel's owners. In 1880, John Denholm of Greenock is recorded as the owner however in the 1881/82 edition of LR, J. & J. Denholm. of Sunderland were the recorded owners. The last LR reference to the vessel under the name of Minerva is that in 1881/82, see left. What happened to the vessel, I wonder? Can anybody tell us? Just a name today. I think that he had a shipyard on the south bank of River Wear a bit east of the road bridge. And that his facility was then taken over by John Denniston. And that the premises they had both occupied were later taken over by S. P. Austin and Son as it expanded after 1870. Need help! We do have the advertisement at left, for 'W. H. Pearson, Ship Builder & Repairer', published in the 1858 edition of 'Christie's Annual Shipping Register, Maritime Compendium, and Commercial Advertiser'. Published by John Christie, of Nelson Street, Newcastle-upon-Tyne, & available as a Google Book here. The advertisement confirms that shipyard location to the east of the bridges, which area was and maybe still is known as Panns. W. H. Pearson is referred to, in an 1852 volume, as being a builder at Ayre's Quay. Now I had thought that also was at Panns, but that seems not to have been so. It was rather a bit upstream of the bridges, on the south bank, at the location you can see here. Just south of the Laing yard. A bottling works, 'Ayre's Quay Bottle Works', is roughly at the site in the Ordnance Survey map of 1897. W. H. Pearson is recorded in 'Christie's' as building two vessels in 1857. Adrien & Griffin, (both barques of nearly 400 tons), covered on site here & here. He is also credited with building 3 vessels in 1847 - namely Cornhill, Endeavour & Ocean, per Murray Wright ex the North of England Maritime Directory of 1848/49. More data as it is found! Murray Wright, of Auckland, New Zealand has been in touch, trying to research his family history. His great grandfather was William Hanson who in 1845 married Catherine Mary Ann Pearson, most likely the daughter of W. H. Pearson, & emigrated to New Zealand in 1858. And built ships there. William had a brother George, and William (presumably Catherine also) & George lived together on Low Street, Sunderland, in 1851. The webmaster will gladly forward to Murray Wright any communication you might have concerning this family history. A 'W. H. Pearson' build list is under construction here. Just 25 vessels are listed today. In due course hopefully the list will include all of the over 40 vessels that he would seem to have built. A (3-masted?) barque, 124.0 ft. long, signal letters HCPS. Per 1 (an 1854 voyage with immigrants to Port Adelaide, Australia), 2 & 3 (newspaper reports ex 4 & 5), 6 (Wreck Inquiry reference). The webmaster has a number of Lloyd's Registers available ex Google books - see left. But placing 100% reliance on such Registers may not be advisable. The vessel would seem to have been sunk in Jan. 1863, yet the vessel is Lloyd's Register listed thru 1869/70 with its listing data quite unchanged after 1863/64. Assuming, of course, that the vessel of the name lost in 1863 is this Time & Truth, which assumption looks to be so but is not fully proven to the webmaster's satisfaction at least. See at the bottom of this listing how the vessel was recorded in the Merchant Navy List. The vessel was built at Sunderland, by W. H. Pearson, for 'Mitcheson' of London (note that Byers, of Sunderland, built a ship for Mitcheson, the Fanny Mitcheson). Intended for voyages to India. Justin Bartlett ('Justin'), of Brisbane, Australia, advises (thanks!) that Mitcheson likely means the partnership of Joseph John Mitcheson, Robert William Mitcheson & William Mitcheson, of Garford Street, Limehouse, Middlesex, (& maybe also of Sheffield) which partnership i) operated as 'J. Mitcheson & Sons', anchor smiths, ironmongers, ship chandlers & ship owners & ii) was dissolved in Mar. 1858. Anyway, the vessel's maiden voyage was ex Liverpool via Plymouth, Devon, which it left on Sep. 17, 1852 for Geelong, near Melbourne, Victoria, Australia, James Dodds in command, carrying 281 immigrants. It arrived at Geelong on Jan. 5, 1853. On one voyage to Australia, the vessel was, I am advised, quarantined at Port Nepean, Melbourne, due to whooping cough. In the 1860/61 edition of Lloyd's, the owner became stated to be A. Brown, likely of Liverpool since the vessel was registered there. However, Justin advises that he understands that the vessel was sold to Australian owners in 1860. The vessel was likely mostly engaged in the shipment of coal. For example, in late Oct. 1862, the vessel arrived at Port Chalmers, Dunedin, South Island, New Zealand, with a cargo of 700 tons of coal ex Newcastle, New South Wales, & also with four houses & 8 cabin passengers. On Dec. 25, 1862, the vessel, then owned by 'Monroe', left Williamstown, Melbourne, for Bluff, southern tip of South Island, New Zealand. The vessel, commanded by Captain Slater, carried 2,613 sheep & two passengers - Mr. & Mrs. Darton. The vessel made swift passage & arrived off the entrance to Bluff Harbour at 2:30 a.m. on Jan. 4, 1863. The vessel stood by, awaiting a pilot, intending to enter the harbour at 6:00 a.m. when the tide was slack. The weather turned bad - wind from the SW which rapidly became a heavy gale. It would seem that the Captain had a choice. He could have run to the east, likely with the loss of the sheep, or attempt to enter the port. He chose the latter. A pilot vessel approached but as the pilot was boarding Time & Truth, the vessel struck a rock a few yards off Stirling Point. The vessel was freed & the damage was initially thought to be minor. But the vessel took on water rapidly & it heeled over. Captain Thompson (or Thomson), the harbour master, came aboard with 20 men, & an attempt was made to tow the vessel & ground it in a safe place. The ship's pumps were manned for many hours. Aphrasia, a steamer, took off the crew & the two passengers & 450 (or 459) of the sheep, all the other sheep being drowned. By 1:00 p.m. that day, the vessel had sunk in 5 fathoms of water. The vessel later lost her main & mizzen masts in the heavy seas & broke up. The wreck had to be removed being a danger to shipping. The vessel was insured, but likely not the sheep. An inquiry was held into the sinking & the master was not, I read, held to be at fault. Additional data or corrections to the above would be welcomed. The Wreck Inquiry report, perhaps? Which may prove the identity of the ship. It would be good also to to be able to read, in its entirety, 'The Barque Time and Truth', an article written for a Cornish newsletter by A. T. Thomas. Which was referenced at a long gone website. Alas, many of the links that used to be referenced above & were the sources of much of the data no longer exist. A few more words re the vessel. The Mercantile Navy List ('MNL') seems to list only one vessel of the name - with Official Number 387. MNLs of 1865, 1870 & 1880 all list John Munro of Melbourne, Australia, as the then owner of the 537 ton vessel, which vessel would seem not to have then existed. Help! A barque. 119.0 ft. long. The vessel was built in Sunderland in 1857 & owned by Thomas J. Reay, James Lancaster, Stephen W. Rackley & John Smurthwaite, (as per Christie's Shipping Register of 1858), all of Sunderland, sailing ex Sunderland with Aden as its intended destination. No later change of ownership it would appear. In the next few years it sailed ex Bristol & Sunderland to the Mediterranean & ex Cardiff to South America. Lloyd's Register of 1863/64 advises that the vessel had been lost. In a report dated at Penzance on Nov. 12, 1863, a vessel named Adrien, en route from Newport, Wales, to Rochefort (near La Rochelle, France, I presume) was wrecked near Gurnard's Head, a prominent headland on the N. coast of the Penwith peninsula of Cornwall, W. of St. Ives. Only one crew member was saved. The vessel broke to pieces. The circumstances of its loss? But was that the correct Adrien? I have my doubts. This newspaper cutting provides greater detail & tells us that the Adrien which was so lost was a French lugger rather than an English barque. It would seem that we still need to find out what happened to 'our' Adrien & when. Can you add anything? A barque. Per 1 (1898 wreck). 120.0 ft. long, signal letters LVPH. I have read that this vessel was registered at Shields, in 1857, in the name of John Dale of North Shields. In 1864/65 the owner became S. Dale rather than J. Dale, clearly Shallett Dale, of London, registered at Shields as per this 1870 Mercantile Navy List ('MNL') page. In 1876/77 the vessel was sold to George Robertson, of North Shields. It would seem that George Robertson soon moved north since in 1880/81 the vessel was registered at Kirkwall, Orkney, as is confirmed by this 1880 MNL page. In 1882/83, the vessel was sold again, to O. Lamberg, of Ystad, Sweden, & renamed Gripen (Griffin in Swedish). In 1887/88 the vessel became owned by C. A. Gr�nvall, also of Ystad. And in the last Lloyd's Register edition available to the webmaster, that of 1889/90, the owner had become L. D. Kemn�r, again of Ystad. On Sep. 24, 1898, Gripen, then owned by A. J. Rundgvist, also of Ystad, was en route from Hern�sand, Sweden, to West Hartlepool, with a cargo of pit props. Captain B. Johnsson was in command. The vessel came ashore opposite Denbeath Colliery, Buckhaven, near Methil, Firth of Forth, Scotland. At or about N56.10.50/W3.1.1. The entire crew was saved but the vessel was a total wreck. Can you add anything? A wooden barque. 118.2 ft. long, signal letters HDBM. The vessel was built by W. H. Pearson, at Pallion, for J. & R. Hopper of Sunderland. Though in 1870 John Hopper, of Sunderland, was recorded as the vessel's owner. Intended for service to the Black Sea. The vessel stayed in the ownership of J. & R. Hopper, later J. Hopper & Co., always of Sunderland, for many years, i.e. thru 1882/83, sailing to the Mediterranean ex Sunderland & also ex Cardiff. In 1880, John Hopper was still the vessel's managing owner. The 1883/84 edition of Lloyd's Register indicates that the vessel had been sold to Norwegian owners, but did not name the new owners. Some two years after the above text was written, I have stumbled upon the answer. The vessel, renamed Isploven, was Lloyd's Register ('LR') recorded from 1885/86 thru 1889/90, owned for that period by 'AktieSelskabet Ipsilen' of Kragero (Krager�), Norway. The 1886/87 edition of LR references additionally J. �lesen, while the 1888/89 edition references J. Olsen. The vessel is not listed in LR of 1890/91. I am still unable to tell you what finally happened to the vessel. Anything to add? I still need help. We have a further major mystery re this vessel. David Watts advises that he has read, in a most credible source that I prefer not to name, that Harvest Queen, a barque built by Pearson at Pallion in 1865, foundered off the Old Head of Kinsale, County Cork, Ireland, on Jan. 30, 1867. At 51.36.30N/ 08.31.30W. The vessel was stated to be en route from Swansea, Wales, to Baltimore, U.S.A., with a cargo of coal, under the command of Captain Matthews & with a crew of 12 - only one of whom survived. The vessel was a total wreck. I gather that the sole survivor was found clinging to a spar, was saved by Henry of Limerick & landed at Queenstown. But I read also that the loss was rather on Jan. 5, 1867. These U.K. Government Reports (1 & 2) did not report a specific date in Jan. 1867 nor report her cargo. Clearly the data that I recorded above & this latest data are in conflict. Can anyone unravel this interesting mystery? It is now my belief that there is no conflict. And that the words in the book that David Watts read are simply in error when they identify the vessel as being built by Pearson in 1865. The barque Harvest Queen which foundered off the Head of Kinsale in 1867 was an American & not a Sunderland vessel. It foundered on Jan. 5, 1867. As per these contemporary newspaper articles. Hopefully in due course we will have confirmation of such identification via U.S. sources. A wooden brig, in Lloyd's as a 'snow', a type of brig. Per 1 (Board of Trade inquiry into 1876 grounding & loss, ex 'Accounts and Papers', published 1876, a 'Google' book), 2 (awards re the 1876 grounding also ex 'Accounts and Papers'). 104.7 ft. long, signal letters HMVQ. The vessel was built for Fairley B. (likely means Fairley Brothers), of Sunderland, for an intended voyage to the Cape of Good Hope. The 1867/68 edition of Lloyd's Register references the sale of the vessel to J. (John) Morgan, of Sunderland. It soon served the Mediterranean trade. Fast forward 8 years. On Jan. 11, 1876, Cydonia, still owned by John Morgan of Sunderland, the vessel left North Shields, with 450 tons of coal, bound for St. Louis (Saint Louis, Guadalupe, West Indies perhaps), with a crew of 8 all told. With William H. (Henry) Hildebrandt ('Hildebrandt') in command. Soon after 5 a.m. on Jan. 14, 1876, a bright light was seen on the starboard bow. The Court concluded that that light was the North Hinder Bank, while Hildebrandt, expecting the Galloper Light Vessel, thought it was in fact a fishing smack. The conditions were hazy, though there was visibility of several miles. At 10 a.m. on the 14th, the vessel struck heavily on a shoal off the French coast near Dunkirk. The seas swept over the stranded vessel, destroyed the jolly boat & washed away the longboat containing Hildebrandt & 3 crew members, presumably preparing to abandon ship. The 4 were unable to regain the ship since there were no 'thowl pins', i.e. rowlocks, in the boat, & in the afternoon the 4 were found by a fishing smack & taken into Dunkirk. The mate, Mr. Taylor, aloft & looking for help, slipped & fell into the sea, to his death. The remainder of the crew were later rescued by a steam tug. No positional soundings were taken after noon on the 12th & at the important times Hildebrandt was not on deck - rather he was below decks and, while capable of carrying out his duties, also was 'not quite sober'. The Court concluded that the vessel & one life was lost by careless & inattentive navigation & suspended Hildebrandt's certificate for a one year period. Any visitor who clicks on the first link above, can read the report from which the above was condensed. The rescue sounds to be, shall we say 'routine'. Another report in the same volume, also linked above, paints a very different picture. The weather was clearly very bad & the survivors clung in the masts high above the heavy seas. The smack which rescued the Master & 3 crewmen was Miroir de Justice. And fishing boat Aigle was also involved. It could not get near the wreck, but after repeated attempts got a rope aboard & hauled one crewman to safety. The tug which saved the final two crew members was Marine, 'piloted' by Aigle. Marine launched its boat & saved the final two with lines. The rescue took place over 2 days & no less than 19 rewards were granted for the saving of life, including 2 gold watches worth �25 each, then a considerable sum of money - to the masters of Aigle & Marine. Can you add anything? Really little more than a name today. I have added the name because of learning of Pak Wan, a vessel that he constructed in 1863, now listed below. It would seem that George Peverall had a shipyard on the north bank of River Wear a little to the west of the road bridge, the only bridge there in his day. At an area called Wreath Quay. And that his facility, perhaps named 'Bridge Graving Yard' or 'Bridge Dock or Dockyard' was later (1880) taken over by Robert Thompson & Sons after being idle for some years. For that valuable information I thank Stan Mapstone: 1, 2. In 1880 the Bridge Dockyard, which apparently had been idle for some years, was taken over by Robert Thompson & Sons, and from it came some spectacular broadside launches, used because the narrowness of the site precluded the ships from being launched in the normal way. There is a photograph of one of these launches in 'Where Ships Are Born'. That photograph can now be seen on page 92. Now that location of Wreath Quay is a puzzle to the webmaster. Elsewhere on this site is a section of an 1897 map which show the river & staiths west of the bridges. Visible here. And at that time Wreath Quay would seem to be quite a distance to the west of Bridge Dock. It is possible however that the term Wreath Quay was applied earlier to quite a long stretch of the north bank. George Peverall was born at Durham City in 1825 & later married Louisa Cornwell also from Durham. The couple had 9 sons & a single daughter born in a number of places in the general Sunderland area i.e. at Newcastle, South Shields, Gateshead & Bishopwearmouth. He was apprenticed to a printer but by 1851 he was 'a prosperous ship and insurance broker at Olive St., Bishop Wearmouth.' In 1861, he was indeed a shipbuilder, employing 20 men & boys, and George Peverall, one of his sons, was his clerk. In 1871 he is listed as being at Nelson Street as a ship broker again & his second son John (described as an iron ship draughtsman) was living with him. By 1881, the whole family had moved to London with employments all unrelated to shipbuilding. Peter Kirsopp further advises - 'Olive St. is behind the bus station, Nelson St. was where Nelson Close is now, SE corner of Mowbray Park.' And that Davison was 'John Davison, shipbuilder at Wreath Quay which the 1858 Directory says extended from the bridge to Low Southwick.'. It would seem that the earlier data in this paragraph came originally from Peter Brownlee, whom we also thank. See the first Annie Archbell link below. It would seem that the 'Peverall' shipbuilding enterprise would therefore have come to an end before 1871? Was John Davison in business for himself, perhaps before or after any association with George Peverall? Heather Davison has advised (thanks Heather!) that John Davison (let's call him 'JohnD' for clarity) was a partner in Davison and Stokoe shipbuilders - it is believed after Peverall and Davison came to an end. JohnD was a brother to Joseph Fenwick Davison ('JosephFD'), a brass foundryman & Heather's great grandfather. Their (JohnD & JosephFD's) father was also named Joseph Fenwick Davison & his father - John Havelock Davison - was a master mariner in his day. JosephFD & his father moved from Bishopwearmouth to Northampton in or around 1915. Can anybody provide any more data! A fully rigged cargo ship which carried some passengers also. Per 1 (Lloyd's Register ('LR') data etc. ), 2 (1861 arrival at Sydney, Australia), 3 (1862 voyage to Sydney), 4 (sinking in 1867, a May 31, 2010 message by 'BumbleB'), 5 (1867 report re loss, 75% down). The vessel is not listed at Miramar. 155.0 ft. long. Built for Brodie & Co., John Brodie, of Trinity Square, London, likely the managing owner, & registered at London. Link 1 advises that the vessel 'started her career by taking government stores to India, but later transferred to the London-Sydney route, and finally the London-China route. Lost in 1867. Maybe named after the wife of James Archbell, of Wapping, London, listed in the 1861 census as being a ship owner. But the Archbell relationship with Brodie (who may have originated in Portsoy, Scotland), is unclear. Would seem to have carried 'stores' to India in Sep. 1860, likely to Bengal. Carried a crew of 26 & 9 passengers in a voyage ex London that arrived at Sydney, New South Wales ('NSW'), Australia, on Nov. 15, 1861. And 24 crew & 6 passengers on a similar voyage that arrived there on Oct. 30, 1862. It returned to London with a full cargo, leaving Sydney on Jan. 19, 1863. The vessel arrived again at Sydney in Sep. 1866 & left for Apia (Navigators' Islands, now Samoa), South Pacific, on Oct. 11, 1866, Captain Blacklock in command. 4 advises that the vessel was lost on Terschelling Bank, (West Frisian Islands in the North Sea, N. of Harlingen, Netherlands) on Apl. 13, 1867, with a loss of 4 lives, the remaining 14 crew being saved by Terschelling Pilot Boat #7. And adds that according to the 'Schager Courant' of Aug. 8, 1867, the skipper of the pilot boat received �19, another crew member received �6 & the remaining 4 members of the crew received �3 each from HM the Queen for their services. See 2nd image, at left. It would seem that the crew was 25 in number, with the Captain & 6 crew still aboard on Apl. 13, 1867 & presumably later saved. Heavy seas at the time. The vessel was en route from Apia, Navigators' Islands, now Samoa, South Pacific Ocean, to Hamburg, Germany, chartered by 'Messrs Willis, Merry and Co.', of Sydney, with a cargo of guano. Additional detail concerning her loss is at the images at left. Her Master, for later voyages Blacklock, mostly was 'Morrice' I read, but the name differs from the data at the links above. I would be surprised, however, if LR & the Australian newspapers had the name wrong so many times. The vessel's loss on Apl. 13, 1867 is listed here also (at line 15) with slightly different data i.e. a crew of 23 & only one life lost. Keith Case, of the U.K., advises (thanks Keith!) that 'Morrice' was almost certainly Keith's GG grandfather, David Morrice, born in Jamaica in 1818 but from an Aberdeen seafaring family. He became Master of Pampero (ON 56597, built at Aberdeen in 1867) in 1868 & made two voyages in her. The second was to New Zealand & on to Shanghai. On Aug. 30, 1869, he sailed from Newcastle, NSW, Australia, for Shanghai & was never seen again. Anything you can add? A 3 masted composite fully rigged ship later, thru 1889/90, re-rigged as a schooner, a barque & then as a ship again. But a barque again at the very end. Per 1 (image, Pak Wan), 2 [1866 arrival at Sydney, New South Wales ('NSW')], 3 (Australian newspaper articles incl. her wreck in 1903 when Mauna Ala, ex 4 & 5 etc. ), 6 (1903 wreck report with image), 7 (the 1863 launch of the vessel, as Flying Cloud). 186.0 ft., later 186.2 ft. long, signal letters VNHT. Pak Wan would seem to mean 'white dove'. Long after this listing was first 'published', a newspaper cutting was kindly provided to the webmaster of the launch in 1863 of a vessel built by Peverall & identified as Flying Cloud. Identifying such vessel has proved to be difficult - in particular no vessel of the name is listed in Lloyd's Registers ('LR'). An extensive build list of Sunderland built ships came to my rescue - it clearly links the two names of Pak Wan & Flying Cloud & confirms that they are one & the same vessel. The webmaster has a number of Lloyd's Registers available to him, thru 1889/90, see left. Built for J. (John) Patton of Westoe, South Shields, but registered at London, apparently intended for the China tea trade. It soon became engaged in trade with Australia, often carrying wool. The earliest Australian date reference I could find is to the vessel arriving (2) in Sydney, NSW, on Mar. 2, 1866. It later became active in trade with Japan. In the 1874/75 edition of Lloyd's Register, the vessel was owned by A. (Alex.) Lawrence, also of London. In the 1885/86 edition, & also in the 1890 Mercantile Navy List, the vessel had become owned by J. (James) Gillan, of Newcastle, NSW, Australia, though a long expired eBay listing (thank you 'scott-base'), referred to 'W. Smith', also of NSW, as being the owner. That eBay listing also referred to the vessel being sold to Hawaiian owners in 1886 (have also read 1889) & renamed Mauna Ala. But that would seem not to be so, at least per Lloyd's Registers thru 1889/90, as at left. But ... On Aug. 22, 1889, 'The Evening News' of Sydney, NSW, reported that Pak Wan had been sold at a Honolulu, Hawaii, auction to her master Captain Smith - for the sum of �400. Smith would seem to have earlier become her master - in 1888. The vessel had, prior to the sale, been active in the carriage of timber between Puget Sound, Oregon, & Australia, & that continued after the sale. I have not spotted when exactly the vessel was renamed Mauna Ala (presumably named after Mauna ʻAla, the Royal Mausoleum of Hawaii, the final resting place of Hawaii's royal families), but it surely was in or about Aug. 1890. On Aug. 3, 1903, Mauna Ala was wrecked, entering the harbour at Tofolobampo (Topolobampo), on the Gulf of California, in northwestern Sinaloa, Mexico. Under the command of a pilot, she struck the bar with terrific force & broke up. At the time, she was carrying a cargo of railway ties & timbers ex Eureka, California, (270 miles N. of San Francisco) & was owned by Captain Smith, her commander. Captain Smith is presumably the W. Smith referred to above. Was he aboard at the time, I wonder? I read via link 3 that 'She changed owners, and as the Mauna Ala hoisted the flag of Hawaii, which was carried until the annexation of the territory (webmaster note - in 1898) gave her the right to fly the Stars & Stripes. She was a vessel of 820 tons register'. It would appear that the cargo of railway ties, etc., was recovered. Can you add anything? A postcard that caught my eye - it was sold on eBay in late 2013 for GBP 55.00 or U.S. $88.94 - autographed by the three cast members shown in the card - Bill Owen, Brian Wilde & Peter Sallis. There were many lead actors in the sitcom over the years - I wonder in which years the three personalities below were together on the show? It would seem that the show was filmed at Holmfirth, West Yorkshire. There are many items of memorabilia available re the show - just check out eBay any day to see how many. The series ran from 1973 to 2010 & will continue to be broadcast into the future via reruns.